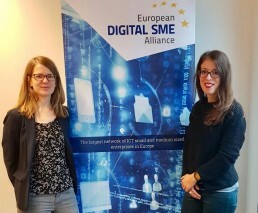 DIGITAL SME is very happy to announce two recent additions to its team at the Brussels secretariat. The new Office and Events Manager, Irene Lanfranchi, who started on 5th November 2018 and Project Manager Annika Linck, who joined the team as from 12th November 2018. Irene Lanfranchi is of Italian nationality, she is fluent in English, French and German and she also has a good level in Dutch and Danish. She graduated with honours from the state University in Milan with a Master’s degree in Foreign Languages and Literatures. Irene is based in Brussels since 2011 and prior to joining DIGITAL SME she has worked in administration, translation, project management and recruitment for over 8 years, in Italian, international and Belgian SMEs. In DIGITAL SME, Irene will be responsible for running the office operations and events. Annika Linck is a German national, she has a Master’s degree in Political Science from the University of Mannheim, and a Bachelor’s in International Business Management (East Asia) from the University of Applied Sciences in Ludwigshafen (East Asia Institute). Prior to joining DIGITAL SME, Annika has been working on EU affairs in Belgium for five years in various positions, namely in the field of research, communications while she has also worked for a global telecommunications company. Her main interests revolve around how to enhance the competitiveness of the EU in the digital field, technical innovation, data economy, sustainable development of society and ICT skills. We wish our two new team members all the best in their new beginnings and we are confident that their experience, skills and expertise will bring additional value to our company.